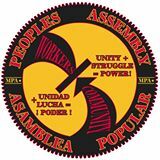 Add yours: info@peoplespowerassemblies.org / Also see UNAC / ANSWER listings. Saturday April 30: 2pm Brook Park; FB Event; Flier in Eng. 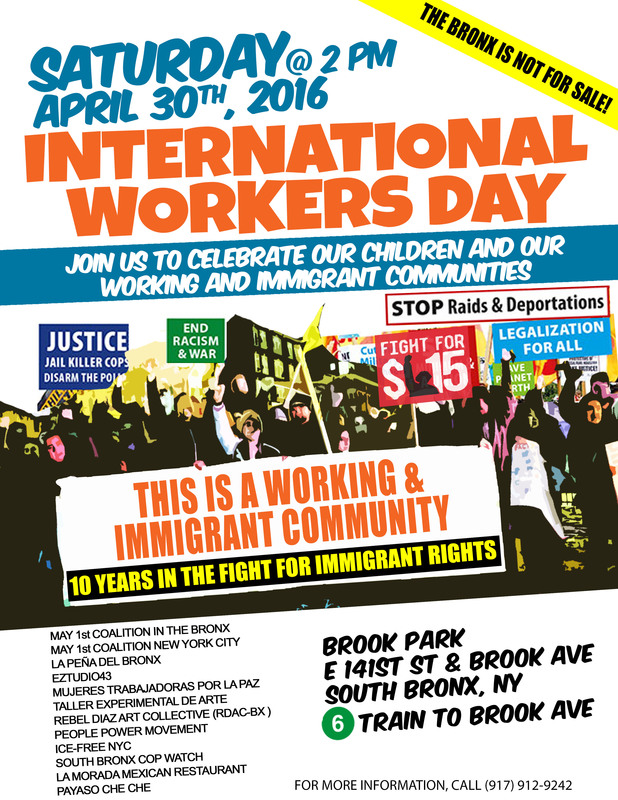 Join Us to Celebrate our Children & our Working & immigrant Communities – The Bronx is not for sale! -Raise the Minimum Wage and Fight for the Right to Unionize! -End Police and Migra Violence! -End the Deportations and Welcome Refugees! -Sun, May 1 -4pm. Oakwood Community Center. FB Event. -Noon, May 1. Legalization for all. SLC City & county Bldg. FB Event. Unite the school! Trans rights march! Selby Five Points Park; 11:00 a.m. FBEvent. AWA is extending an invitation to ALL workers — Black, Brown, Native, White, women, LGBTQ, immigrants and undocumented — come join us in a show of force as we march on International Workers Day! Every day is the bosses’ holiday — except for the 1st of May! Marked around the globe as a day of workers’ & people’s struggles, May Day is an opportunity for our many movements to stand united in solidarity, build our collective power, & express radical alternatives for the world. On May Day we champion a vision of a world of dignity, justice, & liberation for all people. 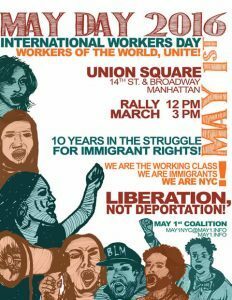 –MAY DAY MARCH – FB Event / We are uniting around a protest of Trump on the right wing agenda against all workers and immigrants! We will gather at Union Park at 1pm, the March will step off at 2pm heading to TRUMP TOWER for the rally! STOP THE HATE! / STOP TRUMP! 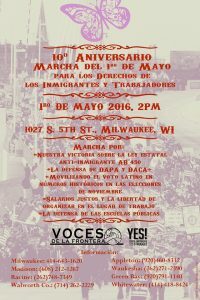 -Celebrate May Day – FB Event – Celebrate International Labor Day with a Rally and Live Music! / Welcome a representative from the World Federation of Trade Unions, who will add a plaque to the memorial. 12pm. Haymarket Memorial Corner. SUN, MAY 1, 2pm CORNER OF South 5TH St & WASHINGTON STS, WE WILL UNITE FOR A STATEWIDE MARCH FOR IMMIGRANT, WORKER, AND STUDENT RIGHTS!! ARE YOU WITH US? SHARE THE VIDEO (see FB) AND INVITE YOUR FRIENDS! 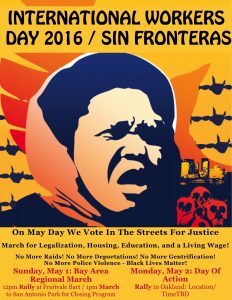 -two events: 2:00 p.m.: DC May Day March 2016 – Gather in Malcolm X Park / FB Event. -3:00 p.m.: Pan-African May Day March for Alonzo Smith – Marbury Plaza, FB Event. Many listings are cross posted from UNAC &/or ANSWER .